Few foods have captured the luxury market quite like caviar, especially at the festive season around Christmas and New Year. At this time of year, many people are ready to spend more and buy some delicacies such as sturgeon meat and caviar. Wild sturgeons are highly endangered and all species of sturgeons are protected under the Convention on International Trade in Endangered Species of Wild Fauna and Flora (CITES). At present, international trade in wild caviar from shared stocks – like from the Danube and the Black Sea – is not allowed. Also, fishing sturgeons is strictly prohibited in most countries. However, illegal fishing and trade in sturgeons are found to continue. Law enforcement authorities have the power to banish illegal sturgeon products from the market. Also, responsible and informed traders and consumers can take care not to buy caviar from poached sturgeons. “Sturgeon populations have severely declined in the past decades: poaching and illegal trade in wild caviar are the main threats to sturgeons”, says Jutta Jahrl caviar trade expert at WWF and presenter in the video “Sturgeon Caviar Labelling Requirements”. A mandatory label with a prescribed code distinguishes legal from illegal caviar. 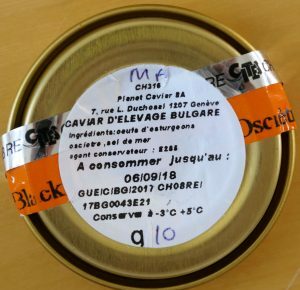 Every tin or jar of sturgeon caviar must bear such a non-reusable label that seals the container or shows when it is opened. The code of letters and numbers provides information on the source and origin of the caviar. The clever system of labelling, how to read this code and other important things to know about caviar and other sturgeon products in trade, are explained in a detailed brochure “Sturgeons and Caviar” and in the video “Sturgeon Caviar Labelling Requirements”, which can be found on this website. The materials were produced in the project LIFE FOR DANUBE STURGEONS to assist the law enforcement authorities in Bulgaria, Romania, Serbia and Ukraine in combating sturgeon poaching and illegal trade. The video “Sturgeon Caviar Labelling Requirements” can be watched in English and with subtitles in Bulgarian, Romanian Serbian and Ukrainian. For each language version, please check the respective language web-page, section Project Materials, video gallery.